As soon as I met Christina Salwitz I knew I had met a kindred spirit. 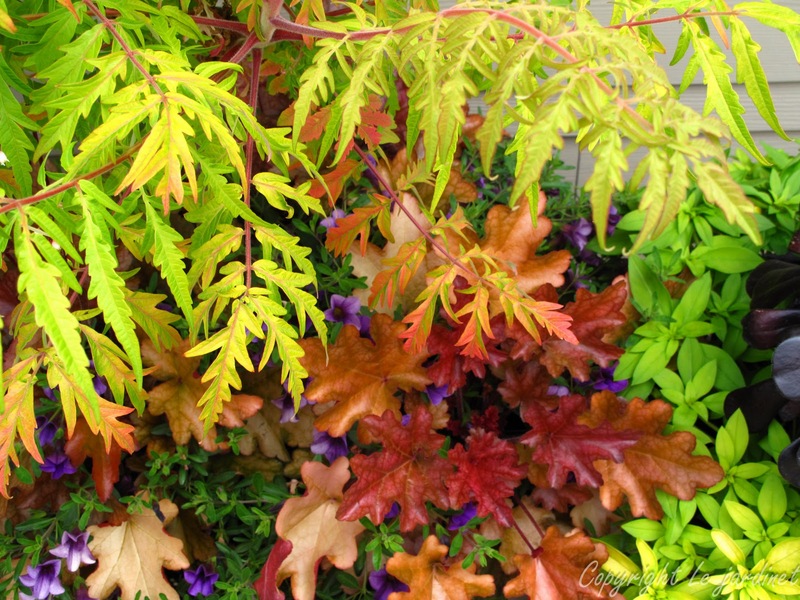 A self-confessed leaf-a-holic, the only thing we didn’t have in common was that I couldn’t restrain myself to just buying foliage plants; I wanted flowers as well! 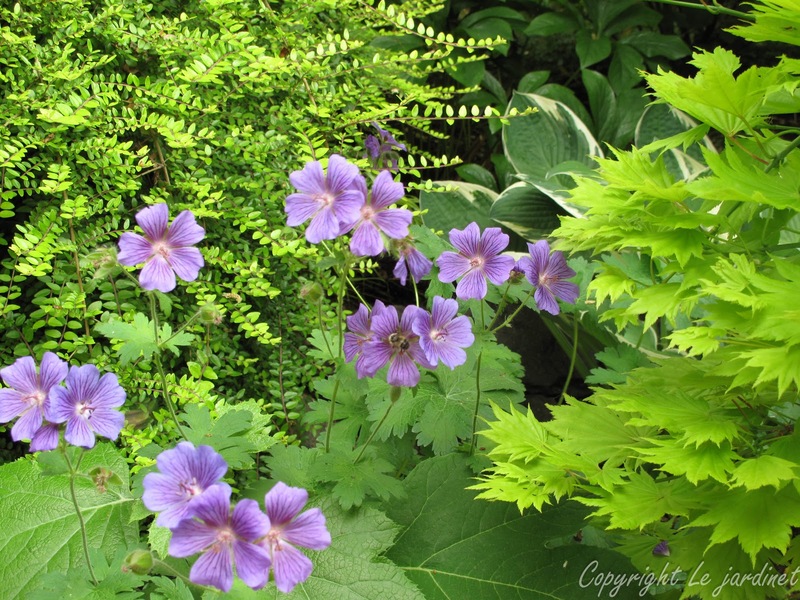 flowers of a hardy geranium add a splash of color. I had the opportunity to hear Christina recently at the Outdoor Living Extravaganza in Seattle, hosted by Proven Winners. She may be barely 5’ tall but her presence and energy filled the room while her presentation was pure eye candy with one mouth watering combination after another. Christina’s philosophy is to begin with a backbone of permanent plants using the ratio deciduous : evergreen at 2:1. Using this framework to establish a color palette such as gold, burgundy and silver, she then slips in any stunning foliage plants that leap into her hands (and there are many). 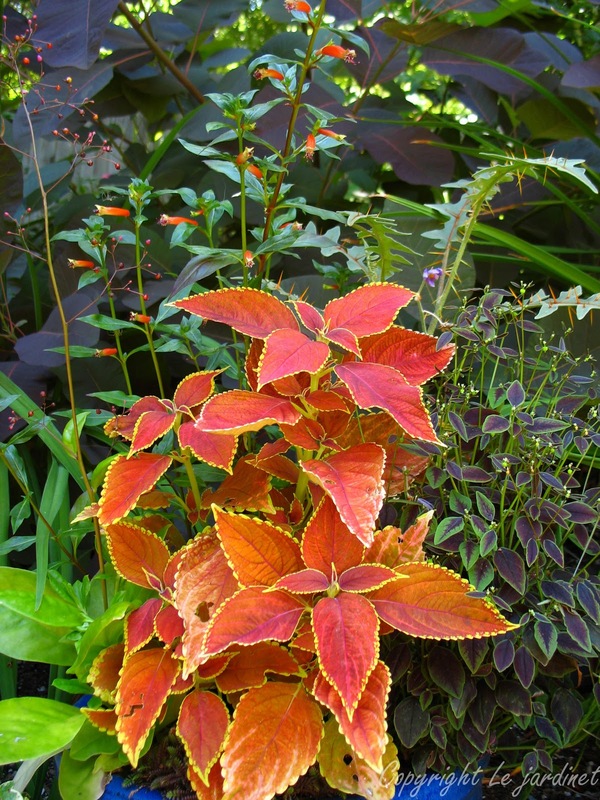 Colorful coleus, hostas and sedums are a few of her many favorites, carefully selecting shades to create moods from cool, icy tones to fiery reds and oranges. Her enthusiasm had me going back into my own photo library to re-discover some of my foliage combinations to share with you. My basic principles are to repeat each color at least once within the combination and to vary the size and texture of the leaves. So if an orange leaf has a chartreuse margin for example I will partner this with something else which is chartreuse, whether a leaf, stem or a bud. Shade gardening lends itself especially well to foliage focused designs. 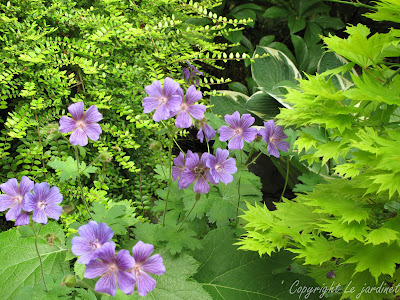 In my last house I developed a small woodland garden by weaving a path of hazelnut shells through a group of ash trees and densely planting the understory with a tapestry of perennials and shrubs which thrived in the dappled light. Underplanting this layer with ephemeral spring bulbs such as English bluebells (Scilla non-scripta) and simple crocus added an extra dimension to the planting. 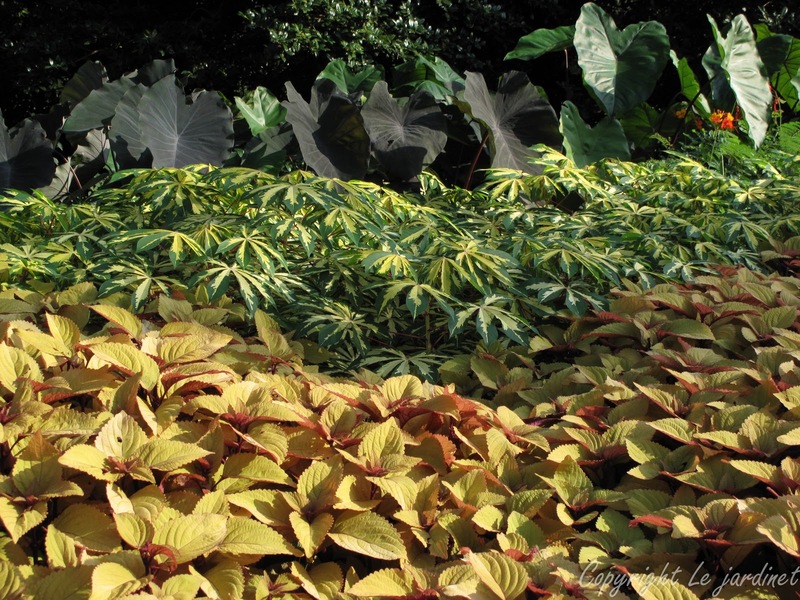 With so many colorful and variegated forms of hostas it is easy to assemble a group using color echoes like the one shown here. 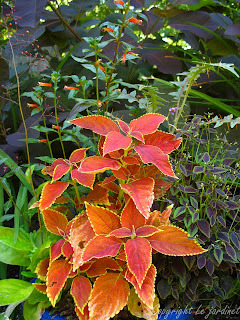 The bold hosta leaves contrast nicely with smaller leaved spurge (Euphorbia 'Orange grove'), grasses and Bishop's hat (Epimedium). (Lamium maculatum 'Aureum') which acts as a groundcover. Christina made an interesting observation when she commented that she "had never found a color which didn't look good in a teal pot". 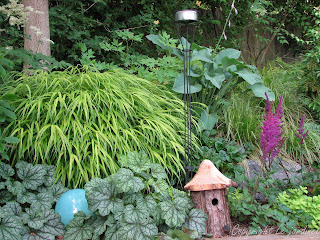 I have to admit she has a point and as I realized that although I hadn't planted in that color container I had used it as an accent to bring out the blue-green shades within nearby plants. to form a pleasing vignette. This teal ceramic globe draws attention to a simple 'Green spice' heuchera and its color partner; a vase shaped 'Krossa regal' hosta. A fountain of yellow Japanese forest grass (Hakonechloa macra 'Aureola') echoes a golden form of creeping germander (Teucrium polium) as a contrast to the cool blue tones. For more ideas revisit my posts 'Adding Sparkle with Variegated Plants' to discover fresh ways to combine shade plants, 'Singin' the Blues' for gorgeous blue-based designs and 'Beyond Rhodies and Junipers' which I promise will have you looking at the possibilities of using broadleaf evergreen plants in a whole new light. Have I given you another excuse to visit the nurseries? Thank you for very kindly and generously adding me into your fun blog. What a nice treat to wake up to this AM! Ya know, we could take on the world together and be quite the force of nature. Have a great Spring- let's get not let it go by without getting together soon! 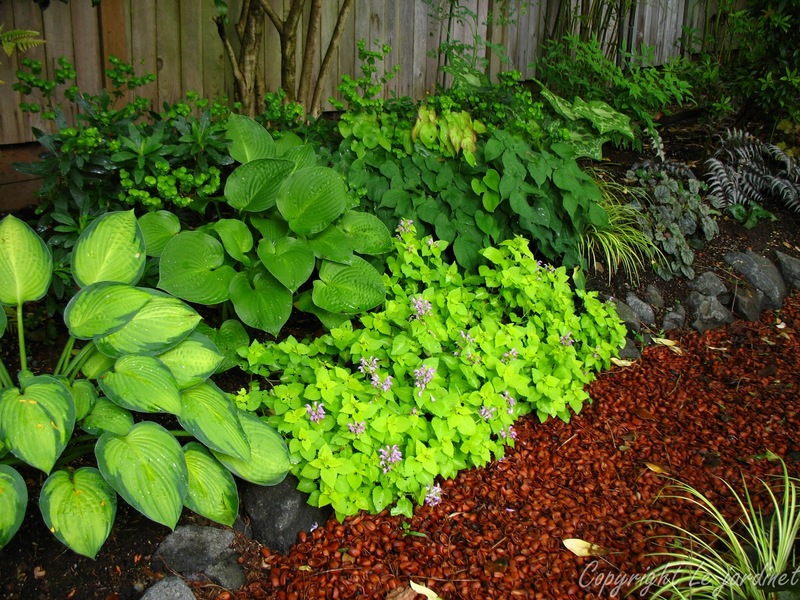 Rain Gardens; Muddy or Magnificent?